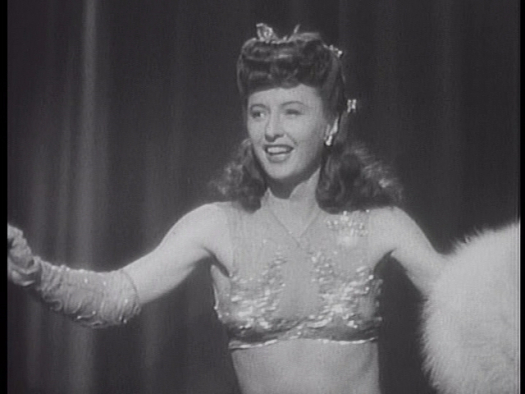 Famed striptease artist Gypsy Rose Lee published a steamy mystery novel called “The G-String Murders” in 1941, all about backstage intrigue at a burlesque house. The book was a best seller, and so of course Hollywood came a-calling, and William Wellman was assigned the director’s job for LADY OF BURLESQUE, a somewhat sanitized version of Gypsy’s racy tome, though Wellman and screenwriter James Gunn got away with what they could in those heavy-handed Production Code days. 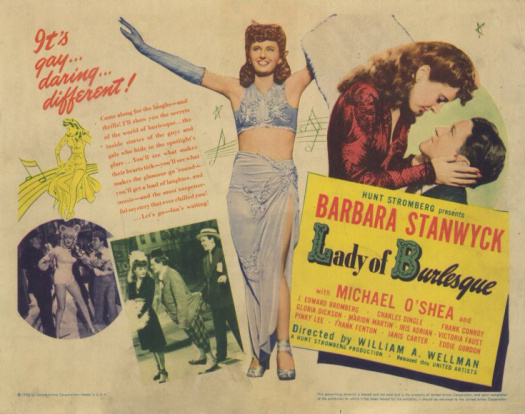 This entry was posted in Film, Film Review and tagged Barbara Stanwyck, Burlesque, Cracked Rear Viewer, Gary Loggins, Gypsy Rose Lee, Iris Adrian, J. Edward Bromberg, Lady of Burlesque, Marion Martin, Michael O'Shea, Pinky Lee, Through the Shattered Lens, United Artists, William Wellman. Bookmark the permalink.